Have you ever wondered how you could get a job as a butler? It's a tricky job these days! Not many people are looking for help like they used to. But don't give up hope. There are still people out there who want to sit in their libraries and wait for someone to take them brandy or stiffly bow and hand them a visiting card while saying, "Sir Hoity Toity is here to see you, sir". We're sure those people exist, though we haven't seen any adverts in the newspapers or on Craigslist lately. Maybe we need to be looking in the right circles, the circles that have country houses and fancy sixty room manors. We're not sure who those people are, but it wouldn't hurt to simply keep your eye on the goings-on at your local manors! These gloves are sure to be the finishing touch on your refined look. 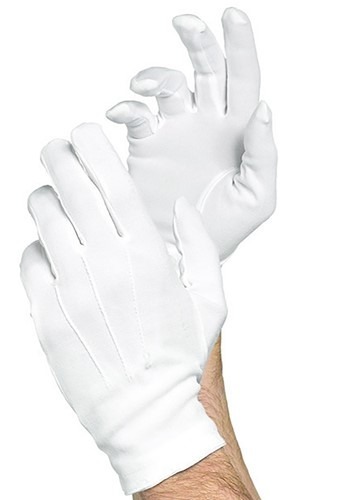 The pure white gloves have seems on the back to give them a cultivated look. Are you ready to polish off your look in a refined way? Magicians, Phantoms, and courtly butlers alike all need to top off their looks with refined accessories! Do it right and you'll find you're fully in character in no time!